At the roundtable the executives talked about the importance of free trade agreements to the success of their businesses and highlighted the many ways their companies are innovating to compete in the global economy. They emphasized that American companies must enter foreign markets on fair terms. However, many countries impose numerous barriers that make it hard for manufacturers like Leatherman Tools to reach those consumers. For example, a Leatherman multi-purpose tool made in Oregon currently faces tariffs as high as 25 percent in Malaysia, while other hand tools from other countries face much lower tariffs. Through trade agreements like the Trans-Pacific Partnership, those barriers would be removed and allow American companies to compete more effectively in the global marketplace. 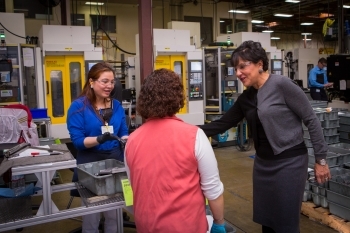 During both of her tours and discussions, Secretary Pritzker made the point that from Washington, D.C., to Takoma, to Portland, the entire Administration is sending the message that new trade agreements are essential to ensuring fairness for our businesses, to upholding our values worldwide, and to advancing our global economic leadership.